Make a list of nagging tasks and start crossing them off on a regular basis - I'm trying to get one nagging task done each week that I don't have a major project in the 52 Weeks plan. The joy of the book for me was more focused on the experience of reading Rubin's ideas and applying them to my own life than on the actual writing of the book. I think she did a fine job with the writing - it's typical of its genre in that it's witty and fun and light-hearted and easy to read. The perfect mix of entertaining and inspiring. I simultaneously wanted to quit reading to put her ideas into action and to neglect everything I needed to be doing so I could read more. The minute I finished I rushed to the Sony Reader Store to get a copy of Happiness At Home, the author's other book on happiness. I highly recommend reading this one. I think it has a lot of practical ideas that are easy to put into practice and truly make life, well, happier. 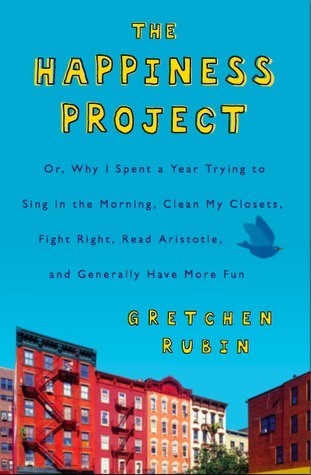 I'm not typically the kind of person who thinks that my greatest priority in life is making myself happy, but I found that Rubin's book really doesn't dwell on personal happiness so much as cultivating a life that makes others happy. It was very generous and others-focused, which I appreciated. I'm glad you liked this one! I almost think of it as a busy woman's way to look after her happiness. The idea of one focus a month really makes it manageable. I haven't read the other one yet. I sent my sister the 52 weeks to an Organized Home blog and she really likes it!